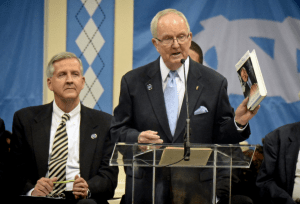 Woody Durham speaks at an event in 2015 honoring the life and legacy of Coach Dean Smith (UNC Chapel Hill). Known as “The Voice of the Tar Heels,” announcer Woody Durham has made an impact on UNC far beyond his words. Now, he is being recognized for his excellence by the National Sports Media Association Hall of Fame. Kennedy Erdossy has the story.